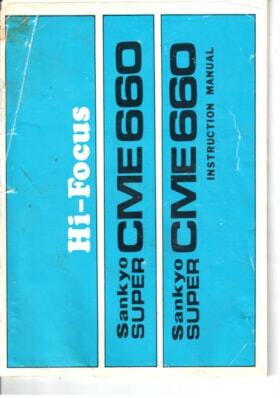 9830 records – page 1 of 492.
a) A Sankyo Super CME 660 High Focus camera made of grey metal and a black fabric covering. 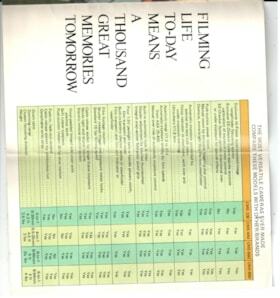 On one end is the viewfinder with a black rubber covering and a black strap. 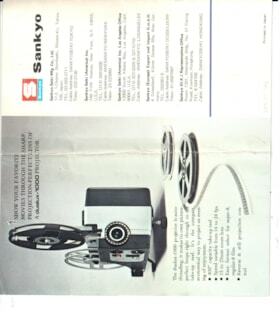 On the side is printed "Saynkyo SUPER CME 660 HI-FOCUS SANKYO SEIKI MFG. 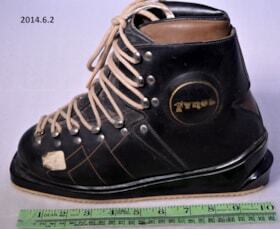 CO., LTD. MADE IN JAPAN". There is also a dial for zoom. 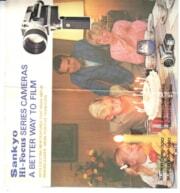 On the front is the lens with black lens cover that says "Sankyo". b) A black case with a metal clasp and a black strap. The inside is lined with light blue felt. 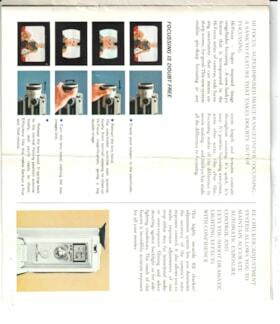 c) An instruction manual with a white and blue cover. d) A catalogue of other Sankyo products. a) A No. 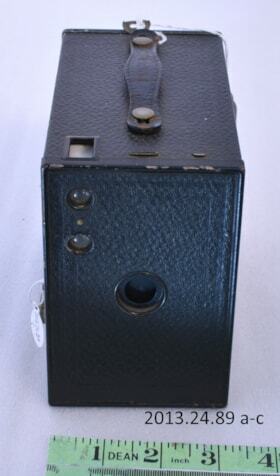 2A Kodak Brownie camera, a model C. It is a black box camera with a black leatherette covering and a black handle. 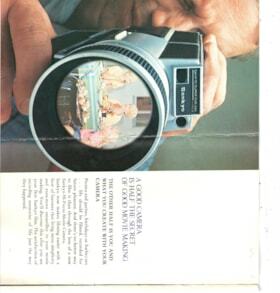 It has a top-down view finder and a removeable back and front. b) The removable front with the same black leatherette covering and metal sections. Printed on the inside in red lettering is "No. 2A BROWNIE Mod. C Patented in U.S.A. Oct. 6,1914 Feb. 1, 1916 Mar. 21, 1916 Patents Pending". 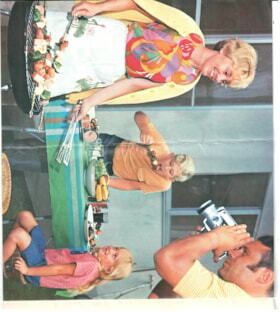 Embossed on the top is "NO 2A BROWNIE MADE IN CANADA BY CANADIAN KODAK CO. LTD TORONTO ONT." 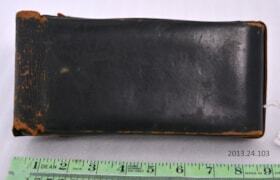 c) The removable back with the same black leatherette covering and a metal inside. 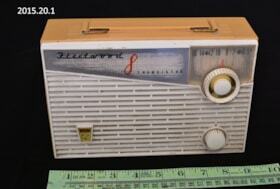 The 2A Brownie was introduced in 1907, and the Model C was introduced in April 1924. It featured improvements such as: an aluminum body, tripod sockets, hinged back with spring latch, and a finer grain leatherette covering. 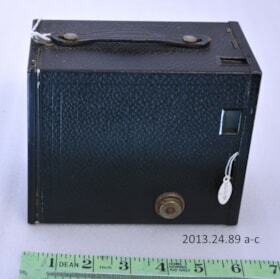 a) A box camera made of wood, with a leatherette covering. 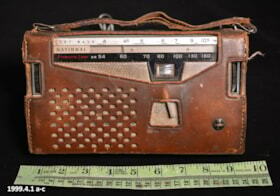 Has a leather handle with "Ensign" on it. 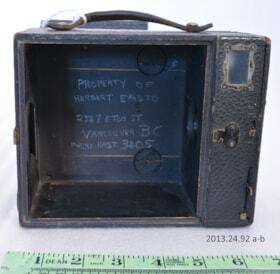 Inside the camera there are handwritten words written in chalk: "Property of Herbert Easto 2547 Eton ST Vancouver BC Phone HAST 3405". 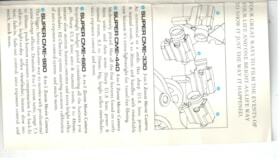 b) The removable middle which is released by two metal latches. 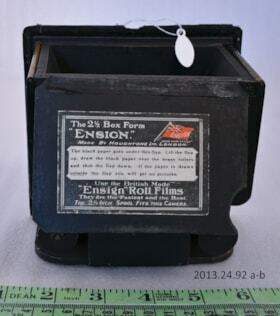 There is a small flap with a sticker that says "The 2 1/2 Box Form Ensign Made by Houghton LTD. London" and instructions for use". 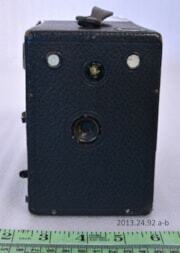 A black leather camera case with a patterned metal clasp that attaches the flap. 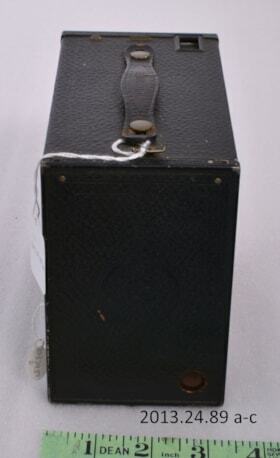 Embossed under the flap is "CARRYING CASE FOR NO 1A SERIES II - III EASTMAN KODAX CO ROCHESTER, N.Y. U.S.A. PATENTED MAR. 3, 1914. 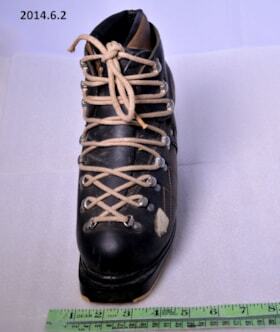 Pair of 1920s speed skates. 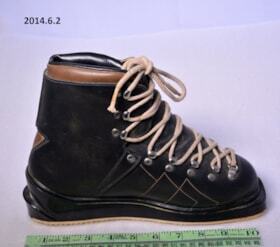 Made of black leather with what were probably once white laces. Tom Britton, who lived in Smithers from the 1930s/1940s on. Back and sides are beige, front is white. The front comprises the speaker. The On/Off switch is in the bottom right corner, and the tuner is in the upper right corner. 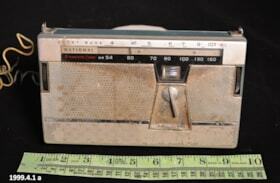 The Radio is FM capable. 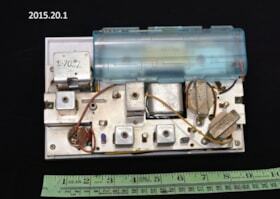 The name Fleetwood 8 Transistor is in the top left. On the back is an earphone jack. The back is stamped MADE IN CANADA and MOLDED IN USE. There is a plastic handle on the top. 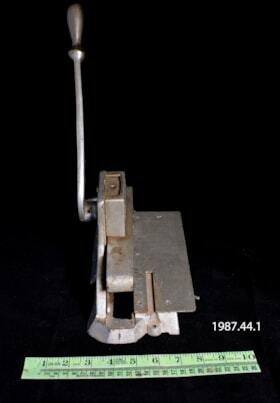 This object is a medium sized silver metal hole punch. 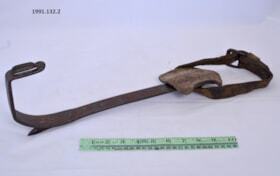 It has a long metal lever connected to the back of the punch. A smooth flat metal plate with a measurement scale on one side is screwed onto the base. This is a two hole punch. 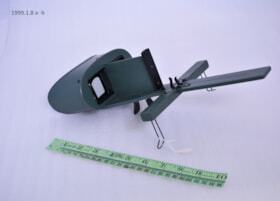 There is also a 8 cm, slightly bent, small rod type lever under the font of the base. 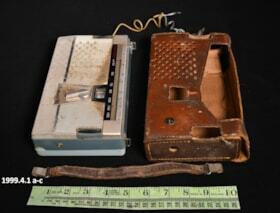 May have been used to punch holes in loose leaf paper. See "http://digicoll.library.wisc.edu/cgi-bin/SilverBuckle/SilverBuckle-idx?type=turn&entity=SilverBuckle.PrintingPlant.p0066&id=SilverBuckle.PrintingPlant&isize=text&pview=hide" for potentially more information. 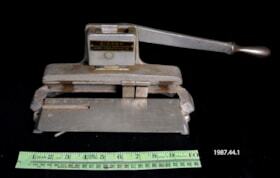 The top plate of the punch reads 'Sieber / Adjustable Hand Punch / Sieber Products MFG. kCo. A brown wooden box with a hinged slanted lid. 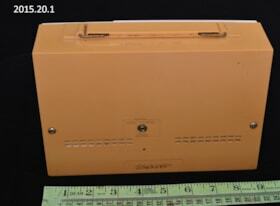 The inside is divided lengthwise into two equal sections for holding letters or envelopes. 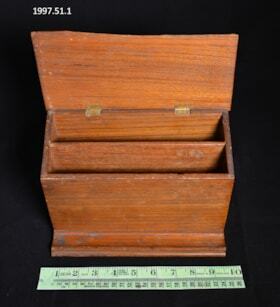 Along the bottom outside front of the box is a 3cm wide, shallow curved section that would be used to hold writing equipment. 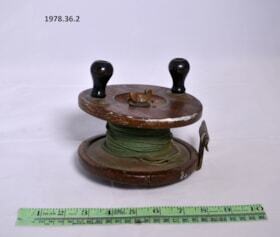 A large wooden fishing reel with thick green line attached to it. 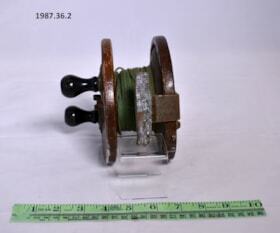 There are two black handles on one side of the reel and a thing metal bar on the other side. A spur consisting of a long, flat, iron brace which is 38 cm long and ends in a U-shaped bottom. 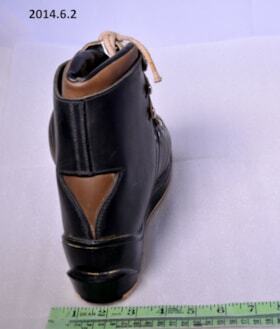 At the top of the brace a thick leather strap runs through a metal loop and is closed by a buckle. On the strap there is a small square pad with a felt backing and a two leather loops which are riveted to the front. There is a metal loop on the one side of the U-shaped bottom and a sharp metal point on the other side. Equipment for the construction of telegraph lines for the Dominion Telegraph system. The back of the brace is stamped with a "4" and there is some indecipherable print near the top. 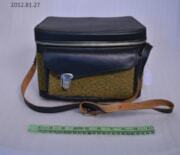 A camera case with a black leather lid with a silver zipper. Its main body has a brown and green fabric covering. 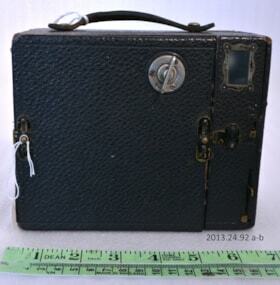 On the fron of the case is a small compartment with a black leather flap attached to the front with a metal latch. On either side of the case are two metal loops that attach as black and brown leather handle to the main body. The inside of the case is lined with red velvet with black details. 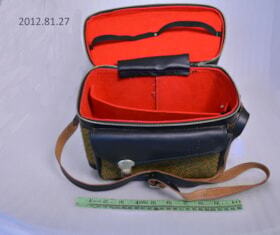 The case is divided into two main compartments. On the bottom of the case are four small round pieces of metal. 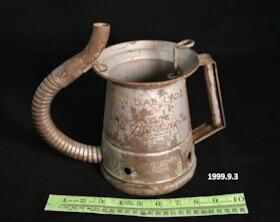 A grey metal can with a moveable spout and a thick, flat handle. The top of the can has a thick lid and inside is a mechanism to release oil into the spout. Embossed on the front is "GAL LIQD TRADE MARK BROOKING CINCINNATI. O. MADE IN USA". Molly Polysou moved to the Bulkley Valley in the 1940s from Austria with her husband. 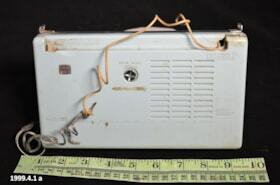 Mr. Polysou worked as a manager for Pacific Northern Gas and died in 1999.
a) Rectangular radio with a light blue back and a grey metal front. Attached to the back is a yellow and grey wire with a clamp at the end. On the front are dials to tune the radio. 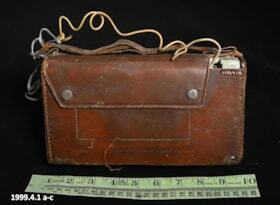 One the back is "Matsushita Electric Industrial Co. LTD. Made in Japan". 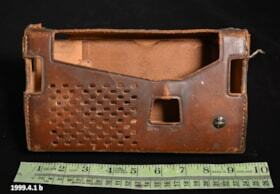 b) A brown leather case for the radio with holes to allow parts of the radio to be revealed. 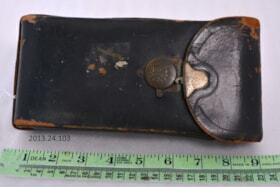 c) The unattachable handle for the leather case. 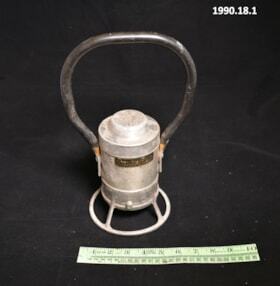 A small hand-held lantern with a metal body and a large carrying handle wrapped in black rubber. 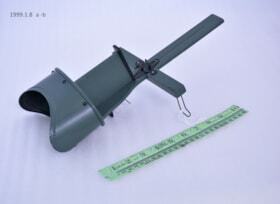 Sits on a round metal stand which also protects the light bulb on the bottom off the lantern. The lid to the lantern is fitted with the words "Caution, remove battery when dead" printed around the edge. Triangle shaped metal base that forms an open pocket. Attached at two places is metal wire that starts apart V-shaped and twists together to form a long rod-like handle. Metal dustpan. Presumably used about the house to sweep dust and dirt into. 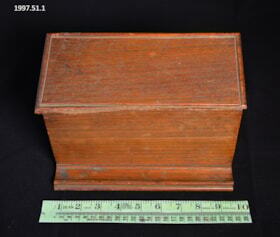 It is presumed that this dustpan originated in the late 1800's, early 1900's. Dimensions of B in description. Pick has a metal head with a tapered pick end on one side and the other is eight sided and rounded with an oval shaped wooden handle. There is an 'M' carved into the bottom of handle. 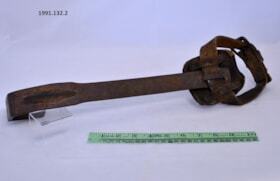 Pick used in mining procedures and originally came from the Chess Tolman farm. Cylindrical shaped lamp that has a handle with a hook on it. 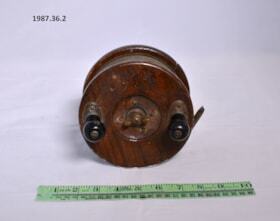 On top of the lamp there is a spout with a round concave upright disk that measures 7.5cm in diameter. 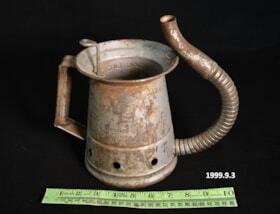 On the opposite side of the spout is a small disk that opens and closes, but is fastened from the inside. Although a small handle is situated behind this disk, part of it extends just above the disk. The handle turns either left or right. The larger handle with the hook extends from the top down to the bottom of the lamp. It is also more angled to one side than the other. The handle and the lamp appear to be in two parts but the handle is hinged together by screws which are holding the lamp together. Carbide lamps were a great advance over oil lamps and candles. 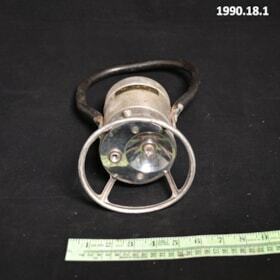 This type of lamp, in common use by 1905, provided a bright light. It was also much safer and healthier for the miners as it did not produce any carbon monoxide and very little carbon dioxide.